Serving delicious ice cream treats in a fun-filled, old-fashion atmosphere since 1971! You can recognize Lee’s right away, because, in Brookfield, it is the only octagon-shaped building with ice cream cone shaped garbage cans, “retro” hand-drawn menu signs hung in the windows, and a glowing neon sign drawing you towards delicious, simple ice cream tastiness perfect for warm summer nights; truly a nostalgic, old-fashion experience with decor bringing you back into the 70s. @leesdairytreat, we’re getting social! 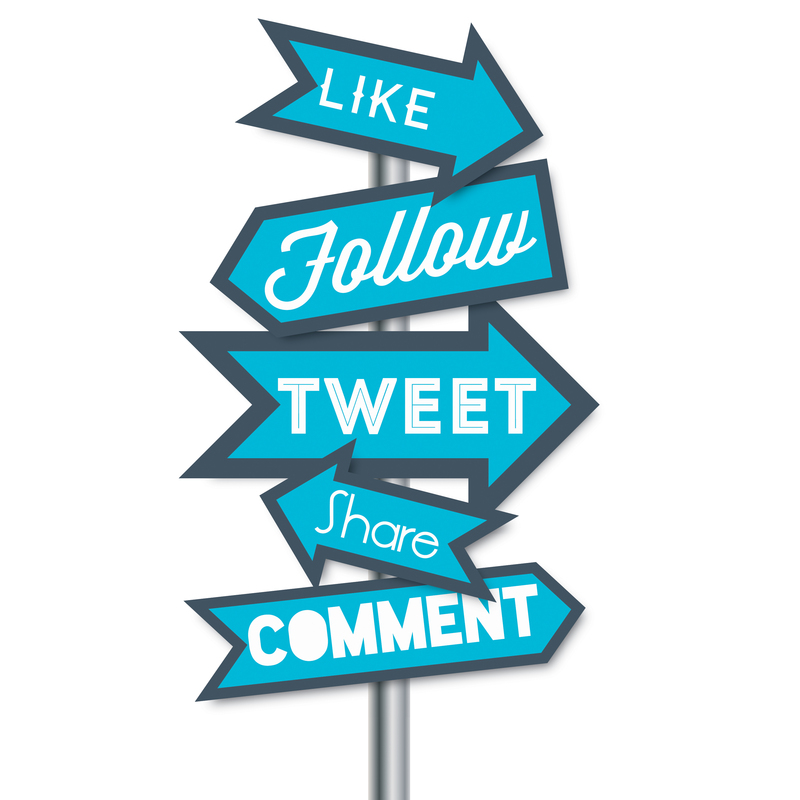 We’d love to see you like, share, or comment on our Lee’s Dairy Treat Facebook page, snap and tag a picture of you at Lee’s on #Instagram, or tweet us on Twitter. It’s nice seeing the experience our loyal customers have that support our small, family-owned, local and community-active business. 96% fat-free. Just remember, that doesn’t include the 40 different mouthwatering toppings you can add to your sundae, shake, malt, or blitz! We are also home of the MONSTER, 32-ounce, quart-sized shake or malt. Lee’s also offers a variety of lunch and dinner entrees including our homemade Bar-B-Que beef sandwich and made-to-order french fries (and other appetizers!). 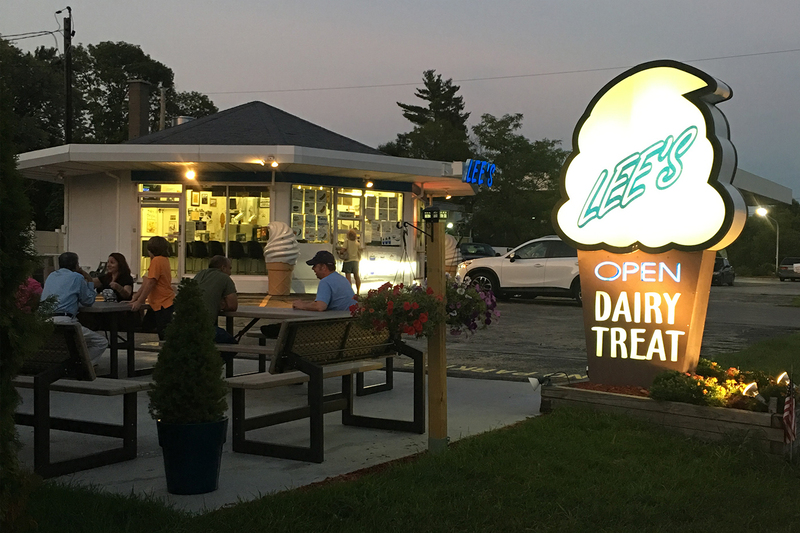 For over 47 years, Lee’s Dairy Treat has been serving the Brookfield area. Lee’s Dairy Treat was established on April 2, 1971 by Leander Bugs and his wife, Clarice Bugs. Leander & Clarice Bugs opened the store which started as a Boy Blue franchise and 5 years later decided to venture off on their own. Leander Bugs passed away on February 17, 1999 battling through cancer. Although his youngest daughter, Danette Bugs-Janik, took over the business in 1997, Lee was still very active in the business. Danette has now been running the business for the past 21 years. Lee’s is a seasonal business open 9 months out of the year from the beginning of February through the end of November. In November and December, Better’s Evergreens sells Christmas trees and wreaths on the lot. Lee’s features an indoor seating corner that is temperature controlled, an outdoor walk-up service window, and also a new outdoor patio area with picnic tables and benches. 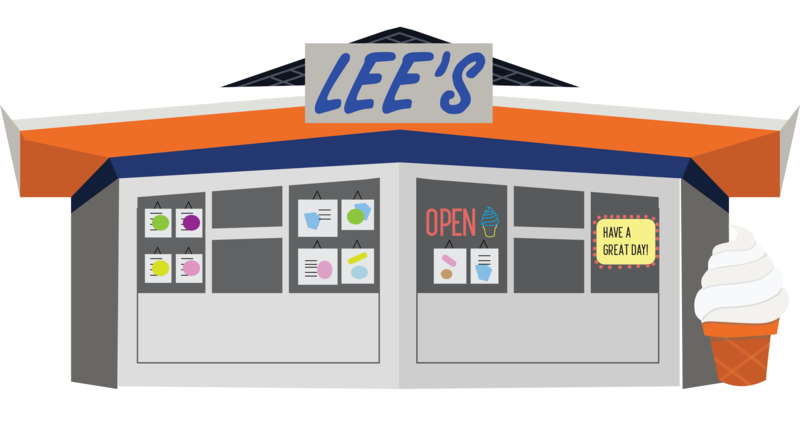 Lee’s is home of the MONSTER malt and has over 40 different flavors for sundaes, shakes, malts, and blitzes. Lee’s also makes its own homemade chili using a family recipe which is served in season and also Bar-B-Que beef. One of the wow factors of Lee’s is that it offers an old-fashion atmosphere. Lee’s has hand-painted illustrations for their menu and the indoor area is very unique unlike most restaurants. Since Lee’s is evolving with technology, Lee’s now accepts Credit/Debit cards (that do not require a pin) and offers free wireless internet to its guests. The ice cream at Lee’s is ice milk and 96% fat free. Don’t forget to take a picture with our state of the art ice cream cone garbage cans — they are nearly 6 feet tall! "A woefully underrated place to get ice cream/slushes etc. Native to the area, used to bike here from folks house. Cherry dipped swirl just like it has been as are slushes and pops. Retro feel to the place that any 80s/90s kid would enjoy." "Owner was very welcoming and server was very efficient. Sundae was a excellent quality." "Delicious ice cream and extremely friendly service!!! Highly recommend!" "Love to eat and enjoy a shake here on the outdoor patio with my family! Prices have gone up a little but they have daily specials!" "We enjoy Lee's all summer and into fall. It's a long standing and local treasure for soft serve treats! The updated outdoor seating is especially nice, too." "Classic Baby Boomer soft serve spot, complete with window service and giant plastic ice-cream cones out front. It's small and clean with traditional treats. Don't expect lots of seating; it's a drive-in. But you can always eat in your car, you know, 'Boomer style." "The owner, Danette, is the sweetest lady and it's all family-owned so it makes you feel like family. This is a great place!" 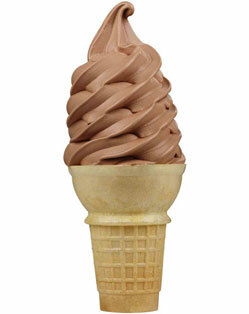 Not only does Lee’s have the best soft-serve in town, we also offer a variety of lunch and dinner entrees. We have over 40 different toppings for sundaes, shakes, malts, and blitzes.